Thought it was time for another blog update, but there is not a lot new to report. We’ve done a bit of tootling round; went to London one day for Mostyn to see a voice specialist. It’s such an easy trip on the train. It was quite a chilly day especially walking across London Bridge that spans the Thames River. We hadn’t been to St. Paul’s Cathedral, so we walked over there after his appointment and caught the tale end of a Lenten service. We likely would not have been able to get in at all if they weren’t worshiping, so we were grateful that it is still faithfully being used for services. Dont let the picture fool you–it was literally freezing when I took this picture. A cold brisk wind was blowing across London Bridge–but lovely all the same. 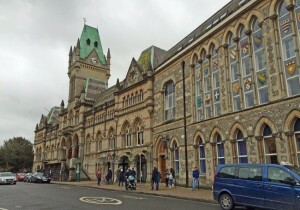 The Winchester Guildhall built in 1871. Winchester is known as the ancient capital of England. Last weekend we made a day trip to Winchester by car. Rainy and gray, but lunch with new friends, a visit to a water mill that grinds wheat, and finding a high end clock shop just adjacent to the large cathedral, made for lovely day despite the weather. We went to London yesterday for a tour of a clock exhibition at the Science Museum and to look for some other fun and interesting things to do. 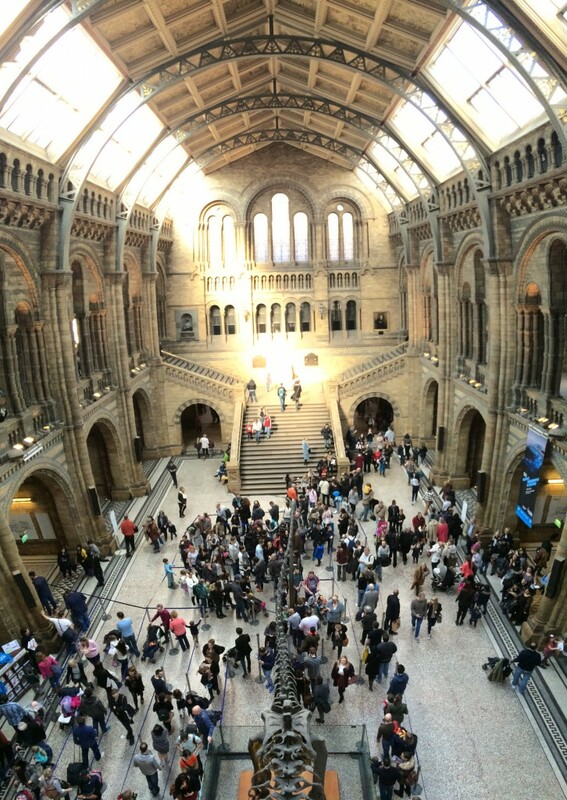 The Natural History Museum–we only had time for a quick visit but all the big museums are free. There was a big line for the dinosaur exhibit but we skipped that. Then in 2 weeks Mostyn is going to Paris with all the students from West Dean and I will go to Reading to visit his sister Nancy and husband Peter. The end of the month we are headed to Vienna to visit his brother, Norm and family and in April we will be in Spain to see his nephew and family and soak up some sun. Needless to say we are not lacking in adventure! Of course the event we are most looking forward to is the visit in May of all our kids and grand kids. They will be here for 3 weeks and we will cherish every single second! When one is driving on the dual carriageway(freeway) the lorries (trucks) are often seen in the lay by’s (rest areas) or at the petrol (gas) stations, unless of course they are trying to access the high street (main road where all shops are) or a car park (parking lot) in the city. They may even be parked partly on the pavement (side walk) to unload and still leave room for other cars to pass. If you become ill you’ll need to ring up (phone) the surgery (Dr.) who may need to send you to Boots (drugstore) for the chemist (pharmacist) to prescribe tablets (pills) for you. While there you may need to buy some plasters (band aids) or nappies (diapers). While in town on the high street you can shop for trainers (tennis shoes), a new jumper (sweater), wellies (rain boots), or add a new brolly (umbrella) to your kit (all you need to complete an outfit). You’ll need pounds or quids (money) and will probably have to stand in a queue (line). The checker who may have a fringe (bangs in her hair), will greet you with hiya (hello) and may be gobsmacked (surprised) to hear you speak. You may need use the lift (elevator) to the loo (restroom) which is often found upstairs. It is summat (somewhat) of a puzzle at times finding the small take-aways (fast food) unless you the know the twittens (short-cuts) and are not too knackered (tired) to walk to the chippie (fish and chip take away) for dinner. You could instead walk to the pub (bar) for a pint (glass of beer) or tea (light dinner) where you may order a variety of dishes including gammon (ham) and bangers (sausages) and followed by a pudding (dessert) or a biscuit (cookie). When your diary (calendar) is full and you have finished hoovering (vacuuming), done the washing up (washing dishes), and emptied the bin (trash), you can take a holiday (vacation) to relax and rest up. But be sure to take your torch (flashlight) as not all holiday lets (vacation rentals) tick all the boxes (have everything you want or need). 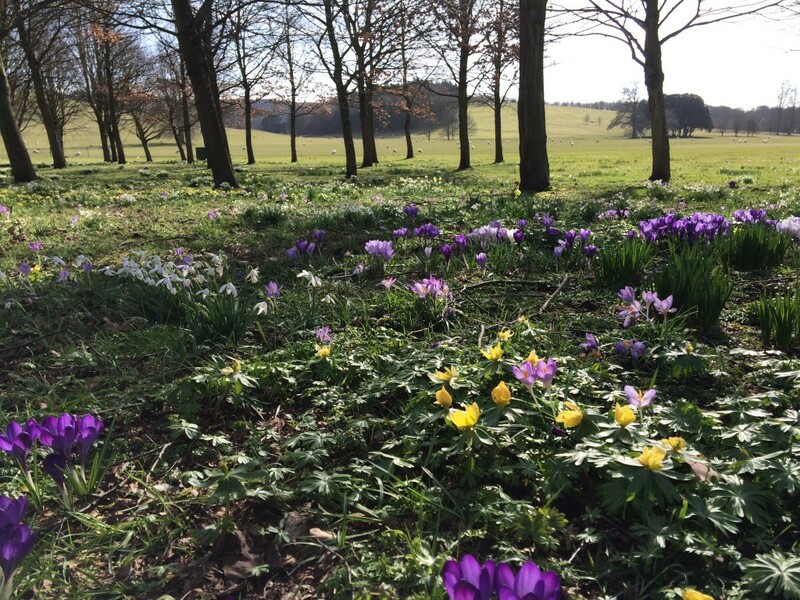 Spring is literally just around the corner and bulbs are bursting out all over the place in small clumps and large expanses in the fields. The sheep are beginning to lamb and you can feel the warmth of the sun when it actually shines. All of this we welcome as the long dark cold winter days are getting a bit old. Spring has sprung here although the days are still cool. No mowers on these lawns for a while. 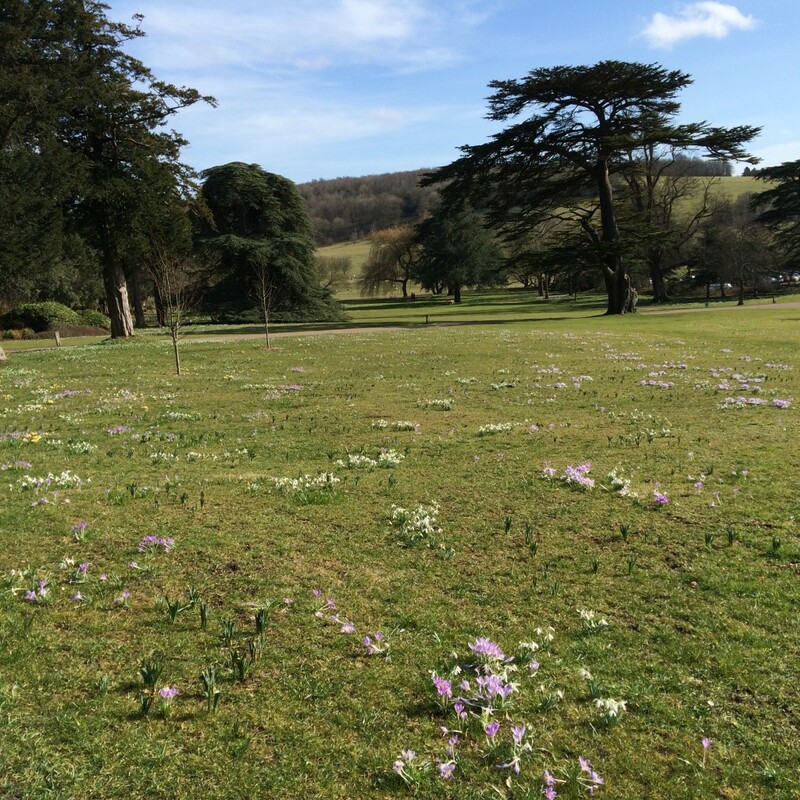 It is lovely to see the bulbs (snowdrops and crocus in this photo) poking up their heads and reminding us that the cold winter days are almost gone. I believe you change to Daylight Saving Time this weekend. We however have to wait till the end of the month. So for a few weeks we will only be 7 hours ahead of you, then we will return to being 8 hours ahead when we change our clocks here. Oh and Mother’s Day here is this month; some tradition from a previous era where servants were given this one Sunday off to be with their families, that has something to do with Lent?? Many differences, but many likenesses too. We have been so welcomed here and on Sunday we got ‘fought over’ by two families at church who both wanted us to come over that day. We ended up at both houses! So that’s it for now. We are well and doing great. Loved reading this. I’m not surprised that England and those you’ve met have a special place in your hearts. May you continue to enjoy the adventure and the relationships. Miss you, yet so happy for this time for both of you! Sounds like you are getting busy too. Congrats on new grandbaby due, your family is a growing tribe! Debbie: Enjoyed your letter and all the info you wrote on your website. Hope to get together again. We will definitely schedule a time to have a cup of tea with you and Ginger when we return home in November. Debbie, Debbie, Debbie. You are becoming a very good writer and communicator. I had a grin on my face as I read your Brit to U.S. translations. It took me back to when I was first subjected to the “English” language. Excellent article, keep them coming. By the way, the bridge in the photo is the “Tower Bridge”. The new London bridge is the next bridge down from it. (The previous London bridge is now in Lake Havasu Arizona. Ken, You are right. 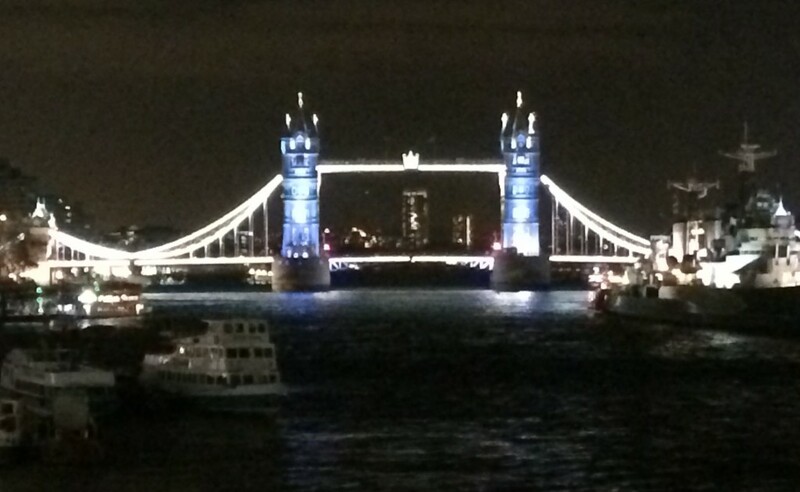 We were standing on the London Bridge looking at the Tower Bridge. Beautiful pictures, and great to get your report. You did a brilliant job of incorporating the British dialect of the English language in your little narrative:) I’m sure you will find that certain words and terms will stay with you. So glad you are enjoying your stay and finding it enriching. I’m excited about your visit with Norm and of course with Dan and family. Wouldn’t I love to join you! Our weather is warming up too. It was in the 60s yesterday. Daffys are blooming and trees are blossoming out. We’re starting to think about what to plant in the garden…tho’ it’s early for that yet. Still getting frost some nights. Just got back from a few days with Nanc and Pete. It was so fun helping them with the child minding of Tim and Ali’s littles. They are very fun. Huw was wary of me at first, but warmed up by end of first day and was able to have fun cuddles with him. Jess too was very sweet and loved reading books with me. What wonderful updates and news! Sounds like your time is as fabulous as you envisioned it would be! Thinking of you and continuing to enjoy your reports that let us in to see a bit of your wonderful adventure. Miss you guys. Have you settled into a new home church this year? We are wondering what to do next fall when we return?? Will look forward to getting together with you when we are home.